When I started thinking of this post I was very far from where I am now, both physically and more importantly, mentally. I’ll start with the now, where I am with laying on a sunbed next to the pool at Club-Med in Florida, where I am on vacation with my entire family. Now the then, which was about a month ago. My man was gone for 2 weeks abroad, and I was home alone with my two little ones, a half a world away from any of my family. And I felt alone. Very alone. The winter decided to peak it’s head back in for the last time, the sky’s were grey and so was my mood. My days were run by what I call “survival mode”,where I do just what I need to do so that my work, both motherly and professionally are done properly. But when the kids went to sleep, I grabbed the quickest, most nutritious thing I could find that would make the least amount of dirty dishes (no allotted time for dish washing in survival mode). The two times I get the most homesick for my far-away family is right after I come back from a visit or right before. It’s odd and goes against rational thinking (and probably why my husband still can’t quite figure out how to console me). But last month I was homesick bad, and with the guy being away, I knew that even though I was in survival mode I had to do something to pick myself up. And that something is what we American Jews call “the Jewish penicillin”. My mom has mastered two dishes down:1. Brisket and 2. Chicken Soup. But every time I’ve asked her for the chicken soup recipe I get the typical Jewish mother response “a little of this, a little of that, I don’t have a recipe”. So I’ve been mastering the art of the Chicken Soup this past winter and I finally perfected it. Just in time for when I needed it the most. So I made myself a large pot, warmed a bowl each night, and ate by myself, thinking about better times, like right now. I prefer a chicken soup with no weird chicken pieces/skin floating around, and my son likes the soup to not have any “green leaves” floating around, so I perfected the method of making a clear (great flavored) broth with just chicken meat and veggies. You can use any vegetables you prefer; I like my soup to be a bit on the sweet side so I use sweet potato and pumpkin and carrots, but you can make it less sweet by omitting the sweet potato and adding potatoes, cabbage or cauliflower. It’s important to cut your veggies the same size so that they cook evenly. For passover you can add homemade or the store bought matzoh balls. I mastered the soup but still haven’t found a good recipe for matzoh balls. I would love to hear if anyone has a good recipe, that don’t end up hard as a rock. 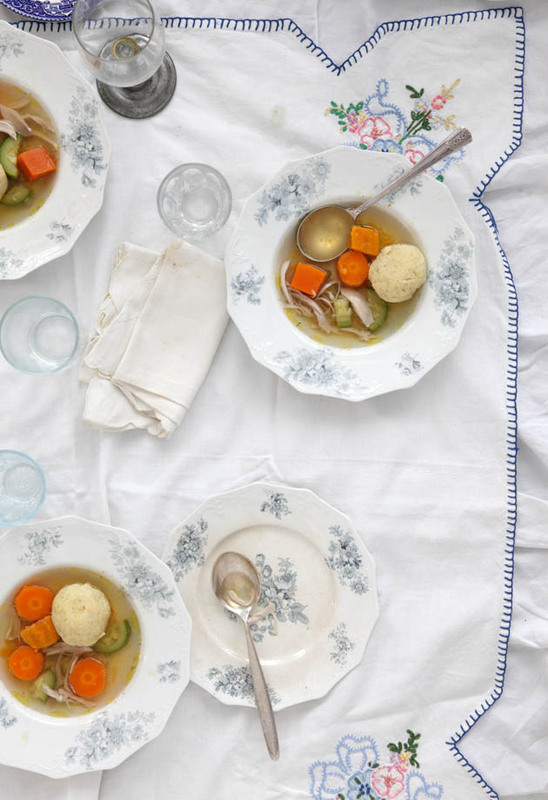 Check out some of our other recipes for Passover here, here and here. 1. 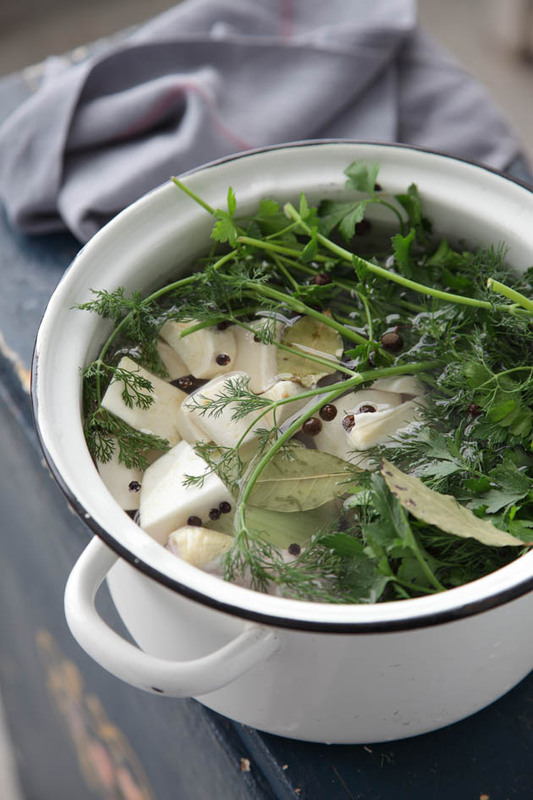 In a very large pot, add the chicken, parsley root, celeriac, onion, parsley, dill, peppercorns, bay leaves and all-spice. Fill pot with water until ingredients are covered. Bring to a boil, and then skim off any chicken fat that appears on top. Reduce heat and allow to cook, uncovered for 1-2 hours. 2. 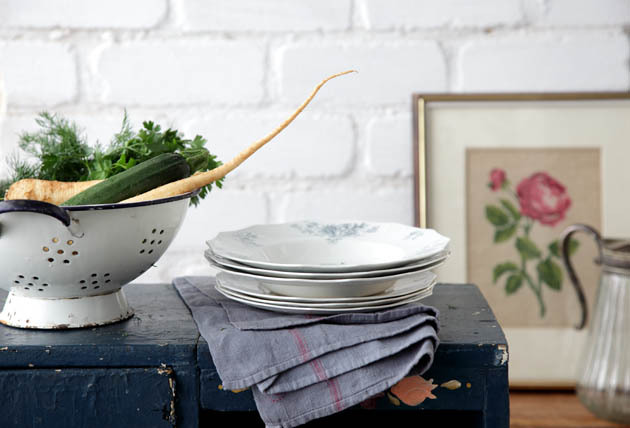 Remove pot from heat and using a fine sieve strainer, strain the soup. Place the liquid back in the pot and set aside only the chicken , discarding all of the other parts. 3. Bring the liquid back to a boil and then add the carrots, sweet potato, and pumpkin. Cook for 15-20 minutes and then add the zucchini and cook for an additional 15-20 minutes, until all the vegetables are softened. 4. Remove chicken meat from the cooked chicken thighs and add to the soup. Season with salt and pepper and serve. I thought I would pass on my 87 year old Mum’s recipe for knaidlach, since you asked. It is a bit of this and a bit of that – but you will be able to perfect it , just as you have the soup! It just takes a little practice-and that’s part of our tradition, after all. She takes one egg and a ladleful of the slightly cooled chicken soup (once its ready) and mixes them well with a fork . Then she adds enough matza meal to make a soft consistency,plus seasonings, herbs,if you like, or even a little ground almonds instead of matza meal. I like them with salt and pepper and maybe a little parsley from the garden. And herein lies the rub. How much to add to make them hold together , but not so much that they turn into cannonballs.? I find that the mixture needs to be a little softer than you think necessary to make balls – cos you then put them in the fridge for a half hour or so, which helps them firm up. After that , you form a ball and drop it into the soup, as an experiment. If it floats and holds together -and puffs up- you may be onto a winner. You can taste it, after you think its cooked- about 10 minutes, but it depends how big you made it. Small is beautiful-I like to form them the size of shelled walnuts. If its OK- then go ahead with the rest of the mixture. If its too loose, then add a bit more matza meal and continue. If its too heavy , you may be able to loosen the mixture by adding a little more soup to it. You can cook them separately, by the way, in a pan of boiling water, if you dont want to reduce a precious drop of the chicken soup. Wow Steph! Thanks so much for sharing. I’ll let you know! Chag sameach.